Israeli News Channel 10 published a leaked diplomatic cable Tuesday, confirming a long-running 'conspiracy theory' of Israeli-Saudi coordination to provoke war. 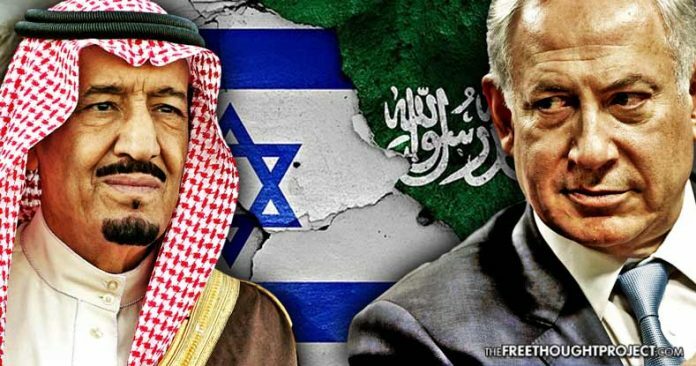 In what can be referred to as a smoking gun, on Tuesday, Israeli News Channel 10 published a leaked diplomatic cable confirming a long-running ‘conspiracy theory’ of Israeli-Saudi coordination to provoke war. As ZH reports, the cable was sent to all Israeli ambassadors throughout the world concerning the chaotic events that unfolded over the weekend in Lebanon and Saudi Arabia, which began with Lebanese Prime Minister Saad Hariri’s unexpected resignation after he was summoned to Riyadh by his Saudi-backers, and led to the Saudis announcing that Lebanon had “declared war” against the kingdom. Channel 10 News released a rough English translation of the of the secret Israeli embassy cable. That translation is below. As has been well-documented, Saudi Arabia and Israel share a common enemy that is Iranian influence. Although the IDF has “warned” of some “potential” direct action against the most notorious terrorist groups in the world which seem to be comfortably ensconced within eyesight of Israeli border posts, it has never taken significant direct action against terrorist groups like ISIS and al-Qaeda and, instead, routinely target the Syrian army, Iranian-linked militias, and Hezbollah with airstrikes. This is a general reflection of the Israeli strategy of regime change in Syria, which has resulted in a well-documented history of assistance to al-Qaeda affiliated rebel groups. This strategy is shared by Saudi Arabia, who, in September, made a “secret” visit to Israel, despite the regime not even recognizing the existence of the Jewish state. Israel’s state-funded Kol Yisrael radio service documented this visit, noting that “An emir of the Saudi royal court visited the country secretly in recent days and discussed with senior Israeli officials the idea of advancing regional peace,” the station reported.